Dr. Martin McCain was recently an artist in residence at the University of Kentucky. On April 17th, he performed a concert for the Central Kentucky Chamber Music Society. The following day McCain coached the University of Kentucky Trombone Choir and taught lessons throughout the week. On April 19th he was a guest soloist with the UK Repertory Jazz Band in addition to giving a masterclass to the studio the following day. McCain was also recently invited to join the faculty at the 2016 International Trombone Festival at the Juilliard School where he will present a masterclass, conduct a participant trombone choir, perform in the Cramer Choir comprised of American university trombone professors and serve on the jury panel for the George Roberts International Bass Trombone Solo Competition. This entry was posted in alumni students faculty NEWS and tagged chamber music, kentucky, trombone on April 25, 2016 by Thomas S. Clark. Bobcat Build sent 10 Phi Mu Alpha Sinfonians to work at First Lutheran Church April 2. The pastor, staff, and several church members praised how hard they worked and what nice guys they are. All expressed appreciation for the Sinfonians’ work and kindness. The Theta Omega chapter of Sigma Alpha Iota also participated in Bobcat Build. 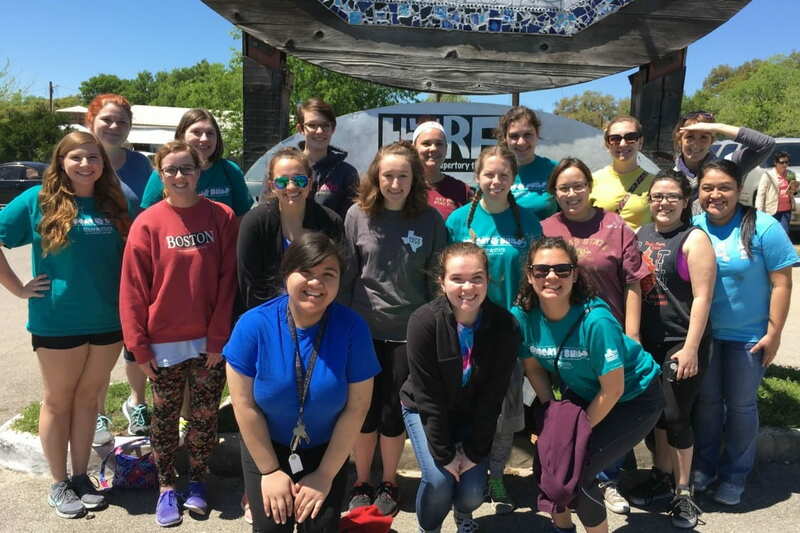 The group went out to the Katherine Anne Porter School in Wimberley, TX and helped paint their new walls that were just finished being repaired after the May and October floods. School faculty and staff were extremely grateful, provided a nice lunch for everyone and the SAI sisters delighted them by singing as they painted! Back: KAP staff member, Kelsee Wuebben, Emily Evans, Krystyn Jensen (advisor), Elizabeth Shults, Echoe Burkhart, KAP staff member. This entry was posted in alumni students faculty NEWS and tagged Bobcat Build, Pi Mu Alpha, Sigma Alpha Iota, Sinfonia on April 20, 2016 by Thomas S. Clark. Veronica Kokas was accepted for graduate study at Westminster Choir College at Rider University with a large scholarship offer, Mannes School of Music at the New School with a larger scholarship, and at George Mason University with an annually renewable scholarship of $10,000. She will be attending George Mason University and studying with Professor Patricia Miller. Celeste Morales was accepted for graduate study at Boston University, the University of Houston, DePaul University with substantial scholarship offers and at the Manhattan School of Music with an annually renewable scholarship of $32,000. She will be attending the Manhattan School of Music and studying with Professor Ruth Golden. This entry was posted in alumni students faculty NEWS and tagged graduate study, music scholarship, voice on April 18, 2016 by Thomas S. Clark. Dr. Kevin Mooney presented his paper, “‘Louise Tobin Blues’: Challenging Gender Stereotypes in Life and Music,” at the American Musicological Society-Southwest Chapter Conference, April 2 at Trinity University, San Antonio, Texas. He was also elected Secretary-Treasurer of the society’s chapter. Dr. Nico Schuler also presented a poster, “Wordless Functional Analysis Revisited”. He completed his second term as Secretary-Treasurer of the Southwest Chapter and was elected as President this past Saturday. This entry was posted in alumni students faculty NEWS and tagged American Musicological Society, Louise Tobin, music analysis, musicology on April 8, 2016 by Thomas S. Clark.